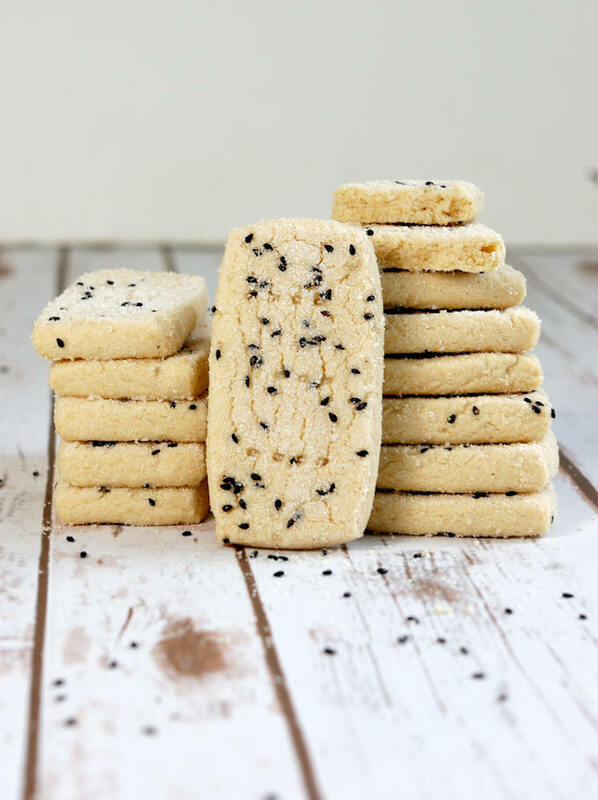 You say Tahina, I say Tahini… However you say it, sesame paste is a wonderful baking ingredient, as you’ll find out if you make these Tahini Shortbread Cookies. I dressed them up with a sprinkle of black sesames seeds for a dramatic contrast in color and texture. 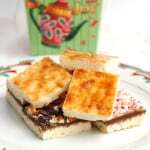 These cookies have a lovely, nutty flavor and they’re not too sweet. Lately I’ve been seeing lots of recipes, many of them for baked goods, featuring tahini as an ingredient. Though I tend to avoid immediately following the latest food trends, this is one bandwagon I was eager to jump on. I love tahini and knew right away it would be a great baking ingredient. 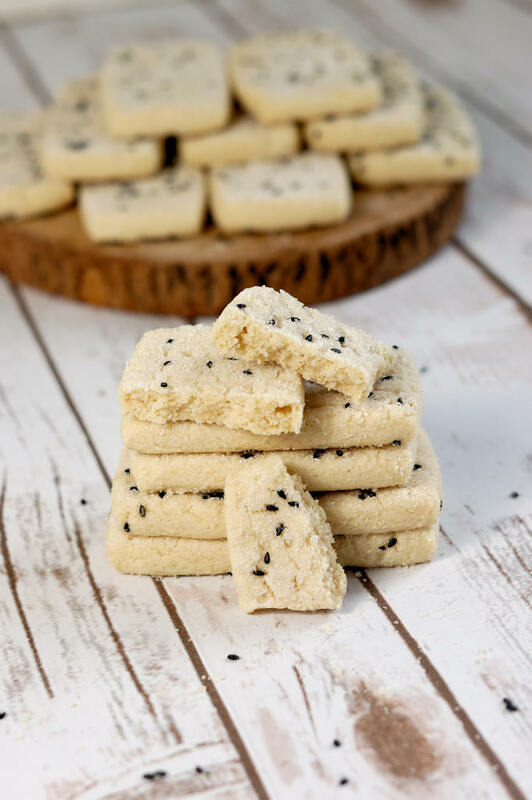 We use peanut butter and almond butter all the time in baking, so why not sesame paste? Of course, in many parts of the world this is nothing new. Happily, here in the US tahini is gaining popularity as a baking ingredient. 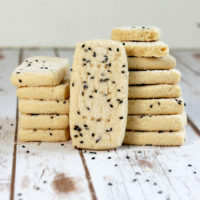 This recipe is similar to my regular shortbread dough, with tahini replacing some of the butter in the recipe. 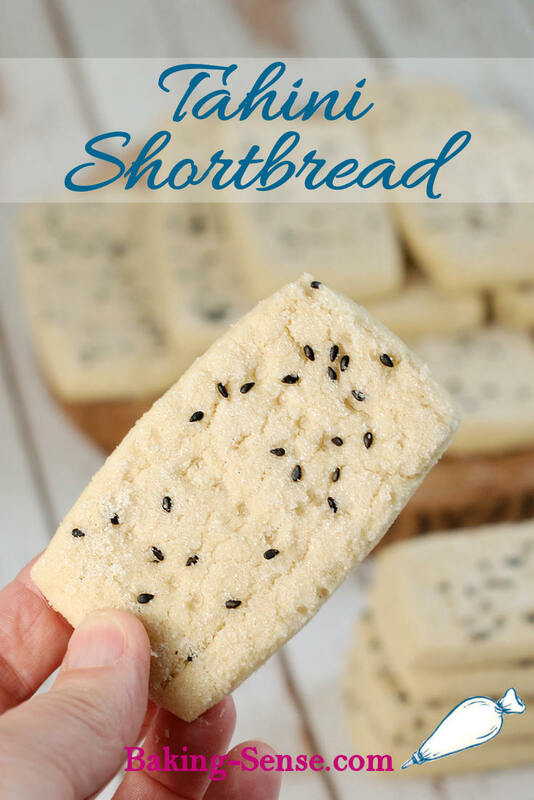 When I make plain shortbread I usually don’t add vanilla or any other flavorings since I want the butter flavor to be the star. 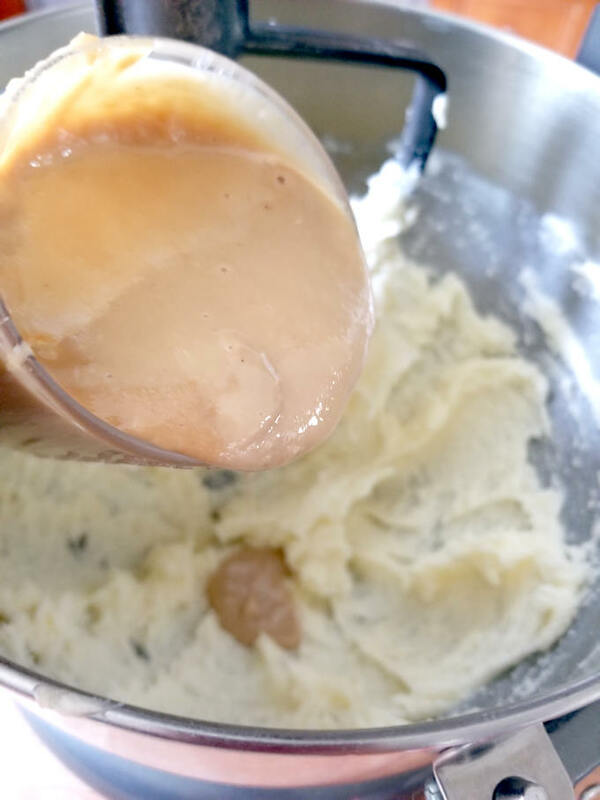 I did add a little vanilla to this recipe to enhance the nutty flavor. A tiny bit of baking powder lightened the dough. 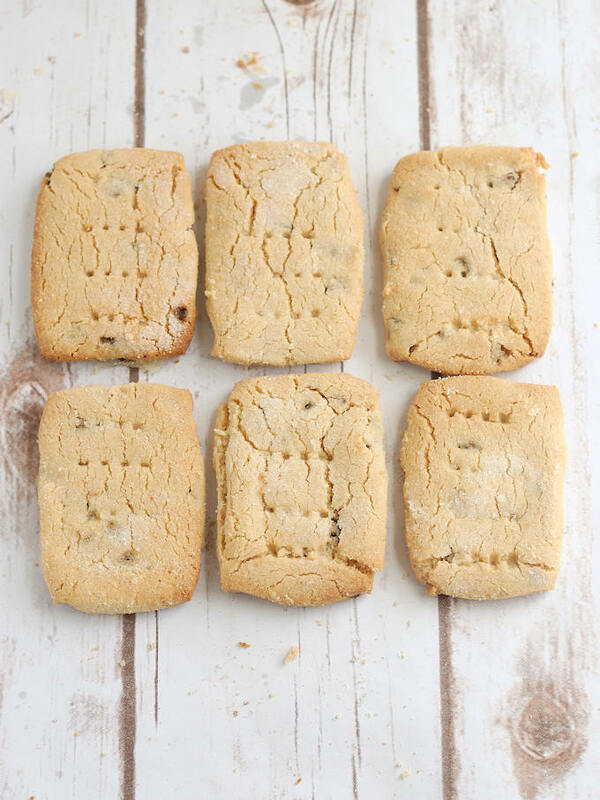 Cream the butter and sugar just as you would for a regular shortbread cookies, then pour in the tahini before adding the dry ingredients. The first time I made this recipe I added chopped dates to the dough. It tasted good, but the dates made the already crumbly cookies even crumblier. I also thought the dried dates became a little too chewy in the cookies. 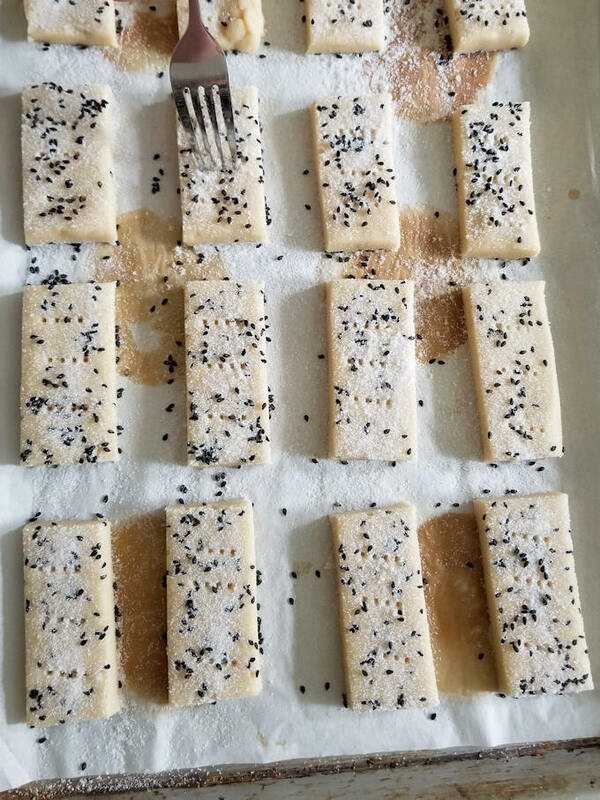 For the second trial I sprinkled the cookies with black sesame seeds. I love the color, contrast and flavor that the seeds add to the cookies. In addition to being too crumbly from the dates, the first batch of cookies were a little too brown and spread more than I wanted. For the second batch of cookies I decided to test how baking temperature can affect the outcome of the cookies. 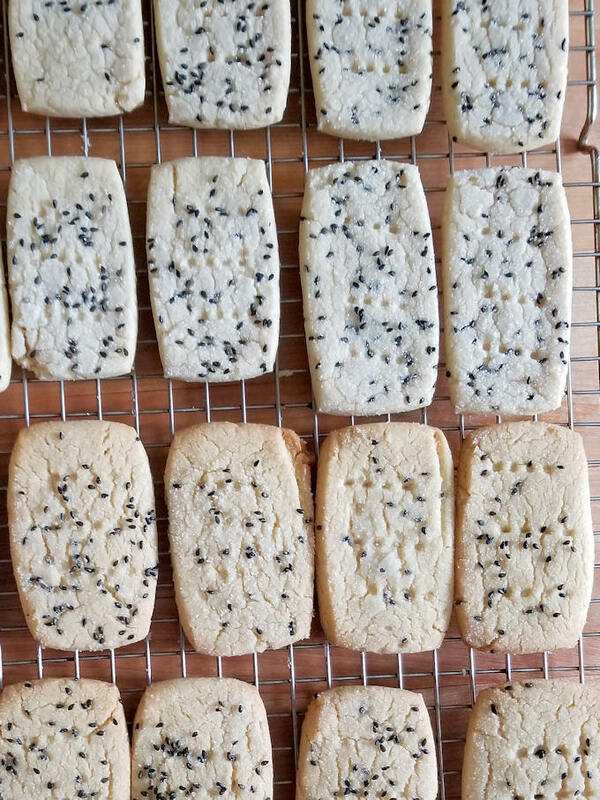 I made the first round of Tahini Shortbread with chopped dates. I cut the cookies too big and the dates made the cookies crackle and crumble. The cookies also browned too much, so I lowered the oven temperature for the next batch. 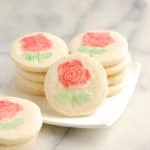 As I discussed in my Rose Shortbread Cookie post, I like to chill shortbread dough before baking to help the cookies keep their shape. I also found that baking at a slightly lower temperature kept the cookies from puffing and spreading too much. If you look at the photo below, you can see how a difference of 25°F baking temperature has a big effect on the outcome of the cookies. The cookies in the top half of the photo were baked at 325°F. They baked slower so they didn’t rise as much and they didn’t brown as much. The cookies in the bottom half of the photo baked at 350° F. They baked up a little browner and they puffed a bit more. The texture of the darker cookies were a little more crisp and crumbly. I prefer the slightly dense (in a good way) and chewy texture of the cookies baked at the lower temperature. But feel free to run your own experiment if you’d like. 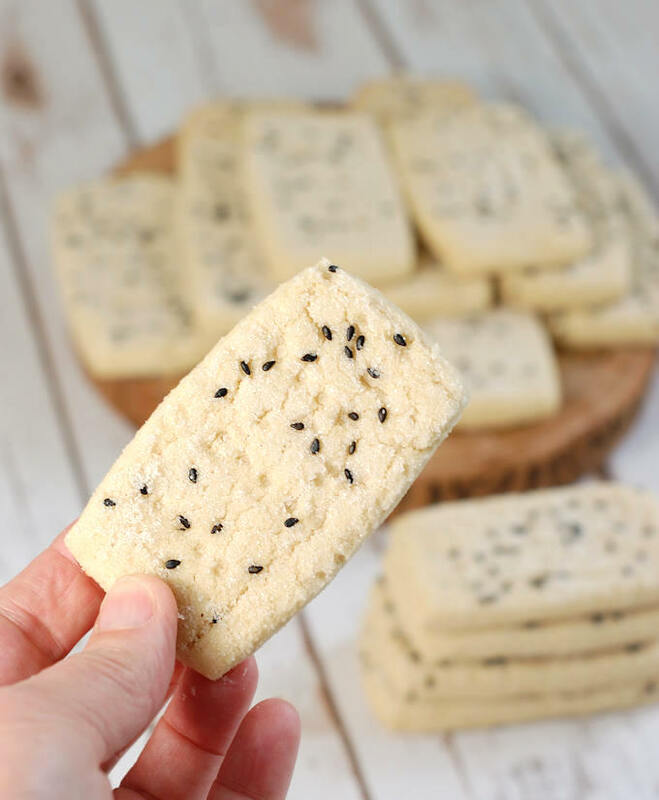 Rich and light shortbread cookies made with Tahini (sesame seed paste). 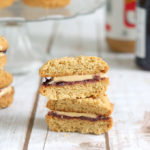 These cookies have a lovely, nutty flavor and very tender bite. They're not too sweet. 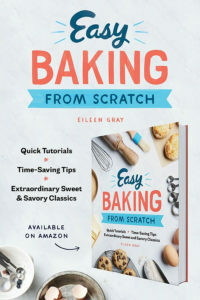 Cream the butter and sugar in a mixer bowl and mix for 2-3 minutes on medium speed until the mixture is lightly aerated. Add the tahini and cream for another minute. Sift together the flour, salt and baking powder. Add the dry ingredients to the butter and mix until almost combined. Turn the dough out on a lightly floured surface and gently form it into a rectangle. 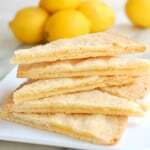 Transfer the rectangle to a sheet of parchment or a silicone baking mat and roll to 1/2" thick, 12" x12” square. 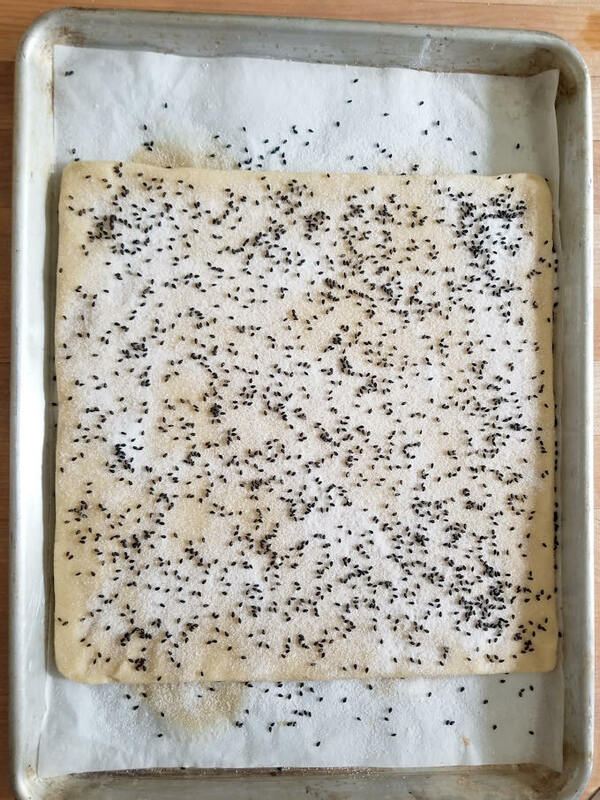 Slide the paper onto a baking sheet and sprinkle the dough with granulated sugar and optional sesame seeds. Refrigerate for 30 minutes. 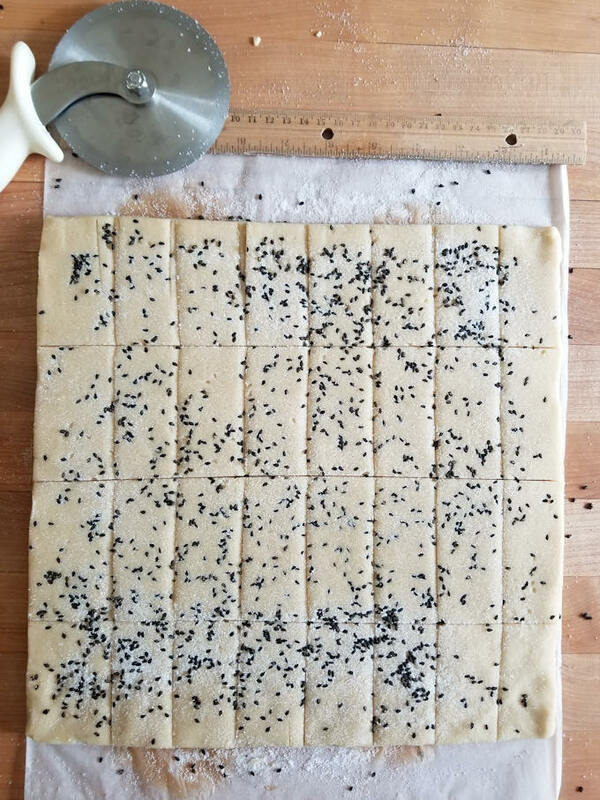 If you don't have parchment paper you can roll the dough on the back of a lightly floured baking sheet. While the dough chills, Preheat the oven to 325°F and line a 2nd baking sheet with parchment paper or a silicone baking mat. Line the cookies onto the baking sheets, leaving 1/2" between cookies. Use a fork to poke 3 holes in each cookie. Bake until the cookies are just set and barely beginning to brown around the edges, 12-14 minutes. (see note) Leave the cookies on the tray to cool for at least 5 minutes. They're very fragile when they're warm and will break if you try to transfer them to a cooling rack right away. To work ahead freeze the cut cookies until firm, the place them in a freezer bag and freeze up to 3 months. When you're ready to bake, line the cookies up on the tray to defrost, then sprinkle with sugar and seeds and bake. If you can only bake one tray at a time, leave the other tray in the refrigerator while the first tray bakes. The cookies spread less if they go into the oven cold. 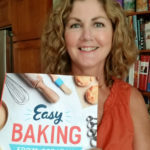 Hi Eileen, I am new to baking with tahini and I want to try these cookies. I am also a Weight Watcher point counter. I noticed that the nutrition info for these cookies does not show a fiber count. I do need this to figure my points. Is there any way that you can help me out by letting me know the fiber count? Thanks so much. 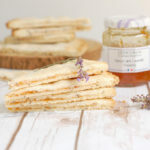 Hi Lola, I just started including nutrition information with my new recipe card so a lot of it is not up to date yet. Admittedly, many people coming to a baking site might not want to know (ha, ha!!). Anyway, I ran this recipe through a recipe counter on a website. I can’t vouch for exactly how accurate it is. But this website estimated 1g of fiber per cookie, assuming you get 32 cookies from the recipe. Thanks for your help. That is one of the best things about WW. I can eat anything as long as I count it. 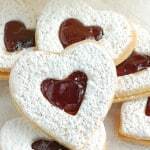 And I am making these for company so they can enjoy them. Great, I hope you like them. I love them.